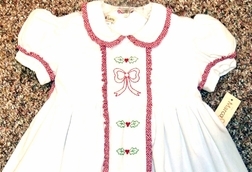 An absolutely beautiful and traditional style dress for baby and little girls for Christmas! 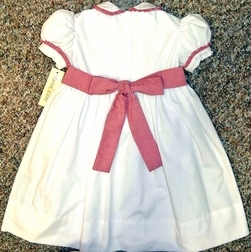 The dress is made with a pristine white fabric and is trimmed around the collar, the sleeves and the front pleat of the dress with red gingham ruffles. 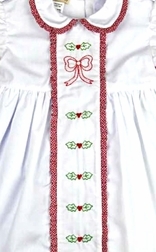 The center of the pleat has lovely shadow embroidered holly leaves and berries and a sweet red bow!